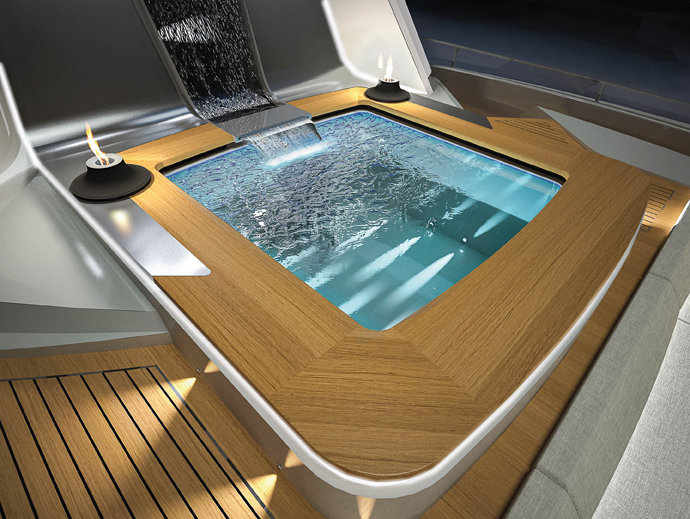 CRN specialises in fully custom builds of steel and aluminium leisure vessels with lengths from 50 to 90 metres. 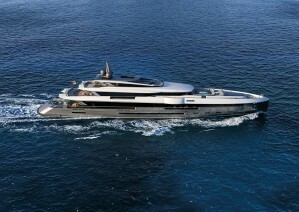 The shipyard has long played an internationally renowned leading role in the exclusive super yacht sector. 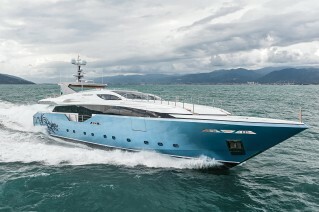 Last year, the famous Italian brand took part in the sector’s main shows where it presented some of its latest gems, including Chopi Chopi, at the Monaco Yacht Show. 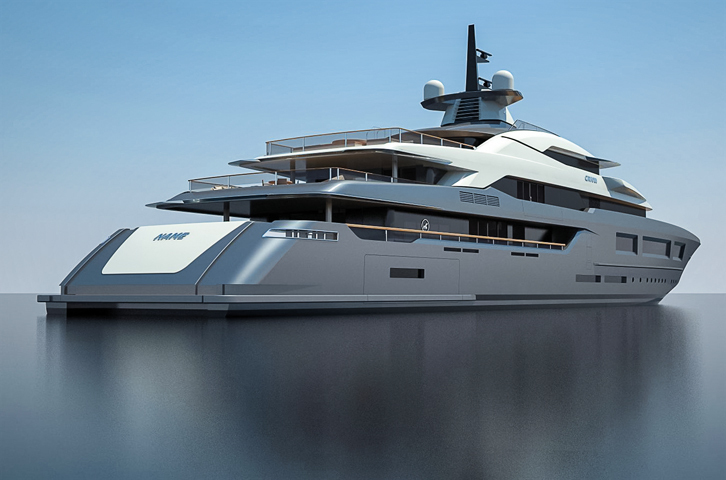 The shipyard also has some more new projects in store for 2015, with another two luxury mega yachts currently in the construction phase – a 55 metre to be launched within the year, and a 74 metre. 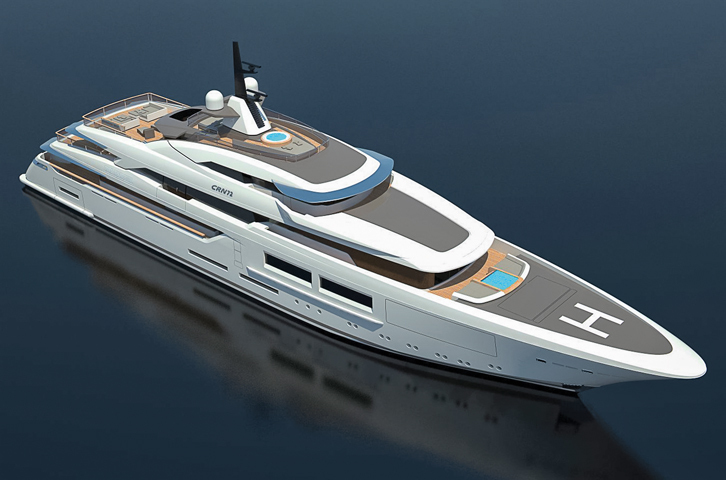 Which of the shipyard’s ambitious commercial and strategic plans could be translated into new projects in the near future? 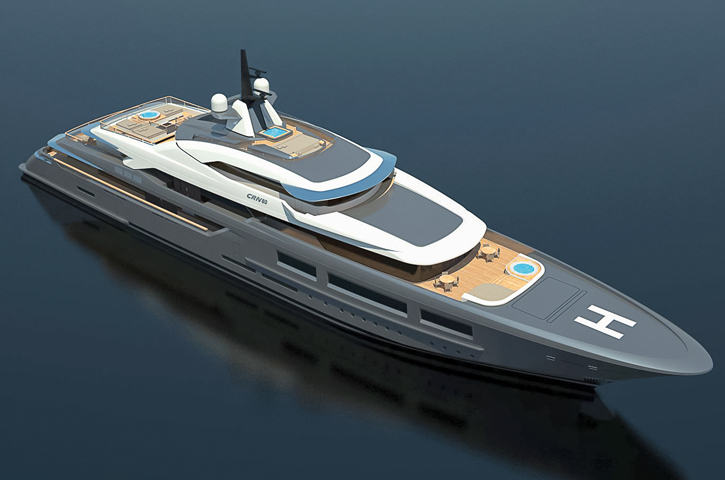 “We are currently developing a large number of designs with various international designers, with whom the shipyard is looking to confirm its focus on aesthetic, functional and technical innovation, without forgetting the needs of the client,” says Lamberto Tacoli, Chairman and CEO of CRN. 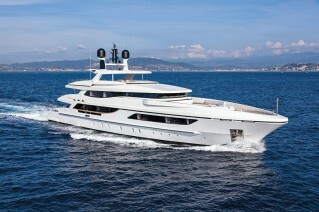 “In particular, with two ambitious new designs produced in collaboration with Francesco Paszkowski Design, we want to expand CRN’s stylistic offering with designs that will become timeless super yachts with large interior spaces, recognisable on every sea.” This new offering from CRN comprises the latest in a long line of top-of-the-range vessels coordinated in a sophisticated technical and aesthetic duet: the new CRN 80 metre and the new CRN 72 metre. 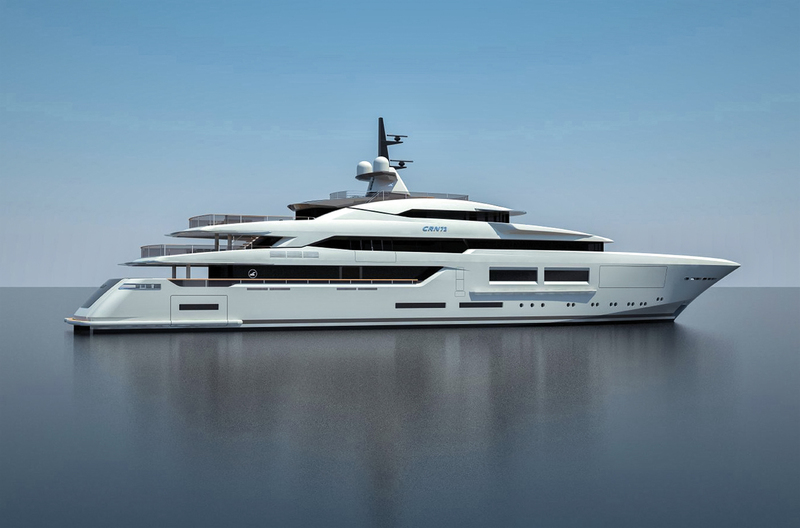 “These two innovative designs are a natural evolution of the stylistic elements of the 61-metre Saramour, which was our first collaboration with a prestigious shipyard like CRN, and it was very stimulating to develop new ideas together,” comments Francesco Paszkowski. 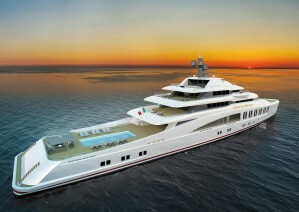 “The designs are also the successful outcome of analysis and research work aimed at finding the optimum balance between interior and exterior spaces.” Although they share the family feel of Saramour in aesthetic terms, these two new mega yachts introduce innovative architectural solutions thanks to clever design work that effectively and skilfully exploits their larger size. To sum things up, the philosophy that played a key role in the concept and steered the design is based on three guiding principles: increasingly soaring lines that give the silhouette lightness, rounded shapes that give the vessel a more compact overall appearance, and extensive use of generous linear glass surfaces in addition to transparent balconies that efface the perception of visual and physical barriers in order to create real contact with the environment and afford a tangible connection with the sea. Some preliminary data and information are now available. We have provided a detailed technical specification to cover the main technical characteristics, while as for the main aesthetic characteristics, we have published 3D renders that document the exterior and interior design from a visual perspective. 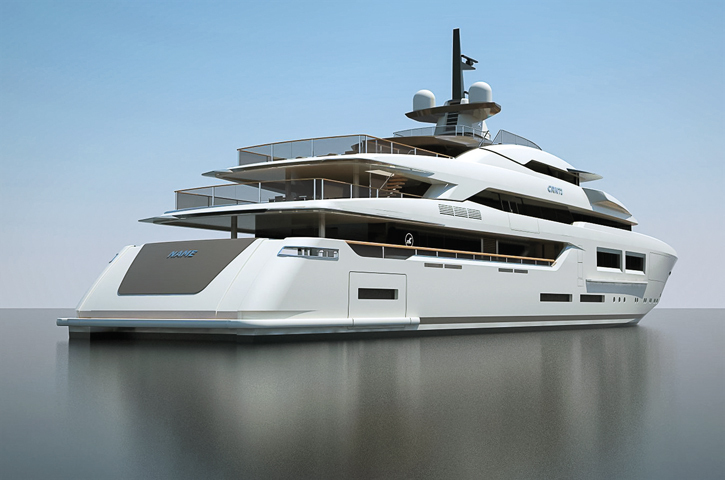 In the accompanying text, meanwhile, we will explore the layout for each of these two new CRN designs with the help of the colour plates that we set out in these pages showing 2D drawings for the vessels. 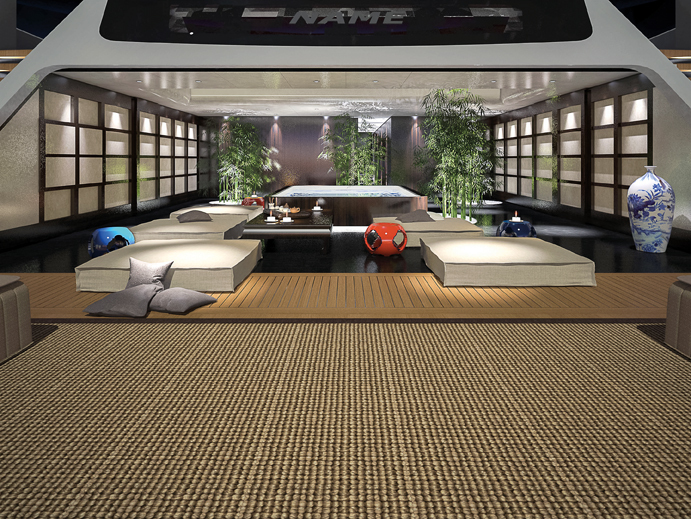 The sun deck features a hydromassage pool and two sunbathing areas with sun pads, while the fly deck to aft has a terrace with a lounge area laid out with sofas and a sunbathing area with beach chairs; inside, the deck has a fully equipped gym, a day head, a sauna room and a massage room. 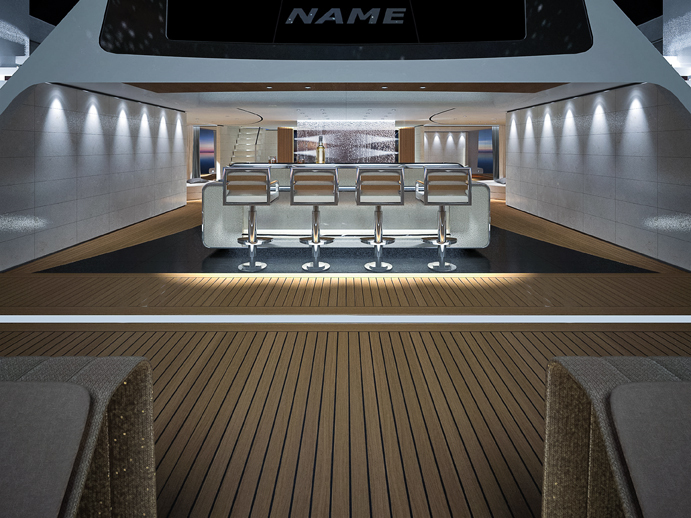 A lobby, a pantry, the radio room / captain’s office and the captain’s cabin with a double bed, wardrobe and en suite bathroom are positioned amidships, and the wheelhouse with instrument panel, three pilot’s chairs and a sofa for guests is located forward. To aft on the upper deck there is a terrace with a relaxation area set out with seating with large cushions and an alfresco dining area with a table and chairs. 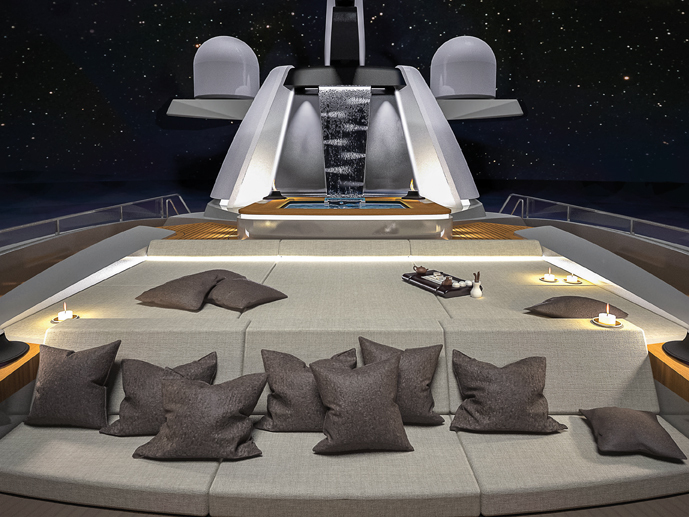 The filter area between the interior and exterior, which has its own bar, is followed by a cinema/party room featuring a maxi screen, seating with large cushions and side walls that fold out to form two balconies. 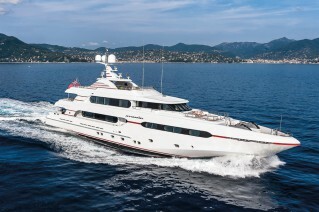 A lobby with a practical day head and a pantry are located amidships, while the Owner’s suite is located forward with a private study/office and desk, a fully equipped gym, his and hers en suite bathrooms, a double dressing room and the master stateroom with a double bed and a relaxation area with a sofa. 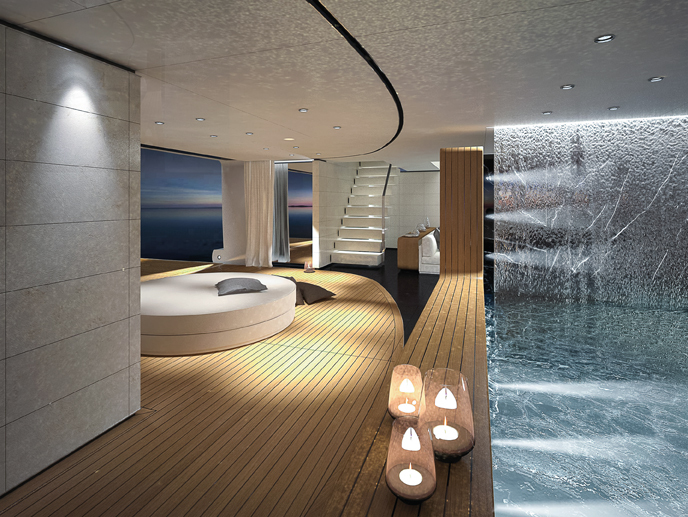 Outside, there is a terrace for the Owner’s personal use, with a hydromassage pool flanked by two sunbathing areas with sun pads. The technical space in the prow on this deck has a garage for the crew and rescue tender and a helicopter landing platform. 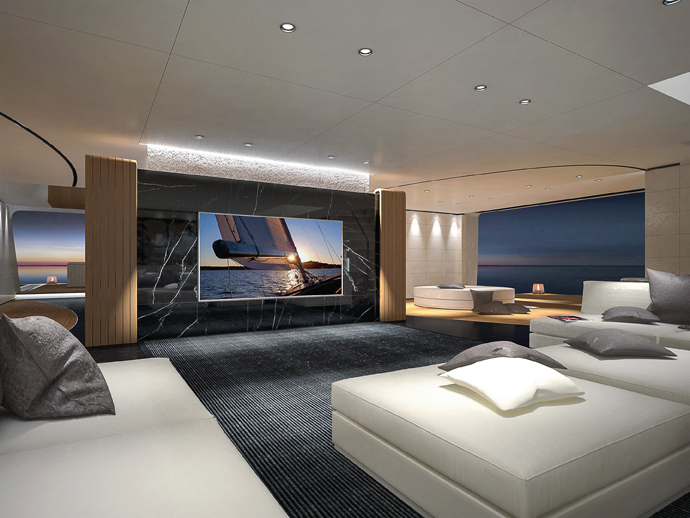 On the main deck, a relaxation/lounge area with sofas is positioned to aft, while inside, an entrance area leads to the salon, subdivided by a wall into a formal living area with sofas and armchairs, and a formal dining area with a table and chairs. 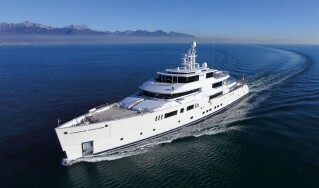 A lobby with a convenient day head is located amidships, along with a pantry and the galley. 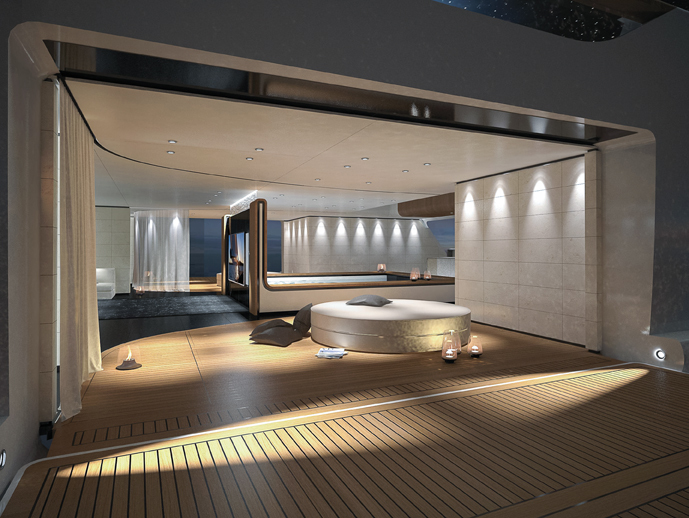 The private VIP guest quarters are positioned forward with an entrance area, a lounge with a sofa and two VIP staterooms, each with a double bed, a relaxation area with sofa, a wardrobe and an en suite bathroom. 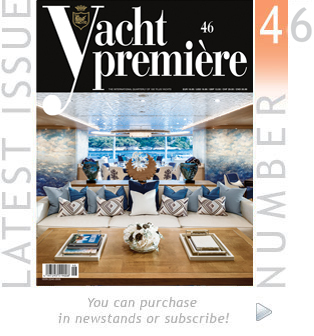 The technical area in the prow of the deck has a garage with hatches to house the main tender, the service tender and two jetskis/waverunners. 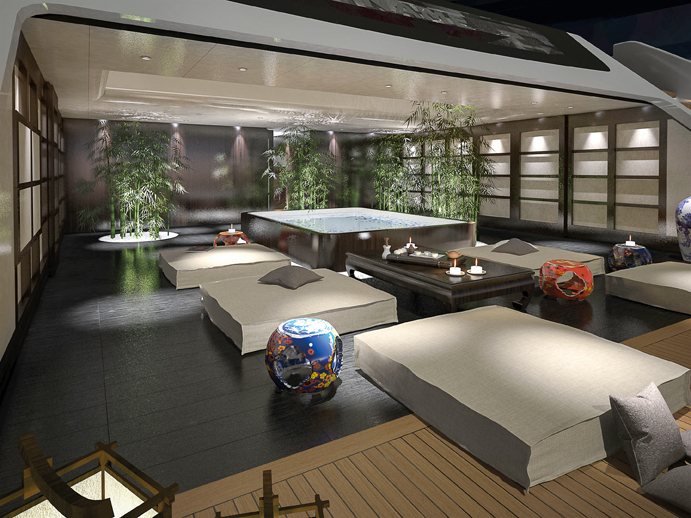 On the lower deck, a beach club area is located to aft, featuring an aft swimming platform and two more swimming platforms to the sides in the external section. 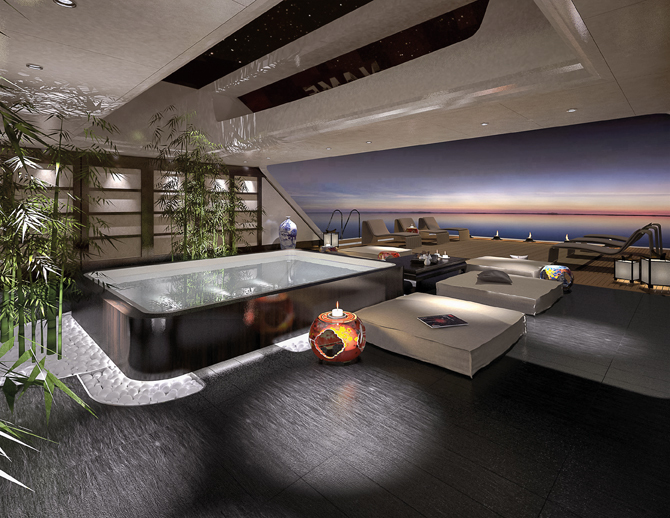 Inside, it features a bar area, a swimming pool, two relaxation areas with seating with large cushions and a lounge area with sofas and a day head. The lobby is located amidships, leading to the private guest quarters that comprise four staterooms, each with a double bed, a relaxation space with armchair, a wardrobe and an en suite bathroom. 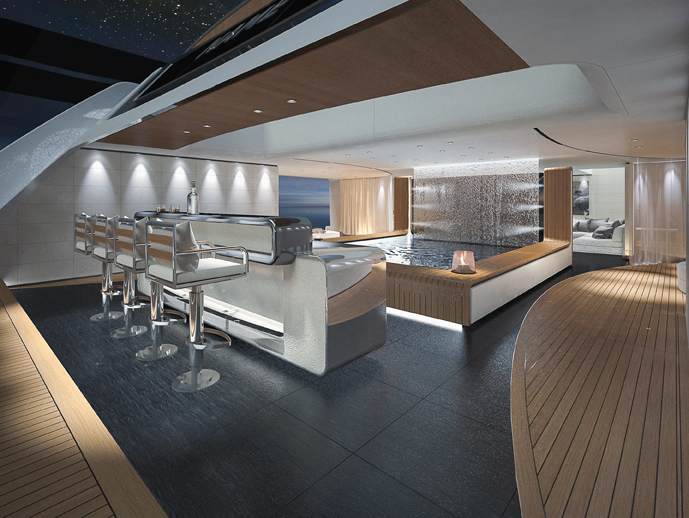 The crew quarters are located in the prow, featuring the crew lounge, the crew mess, an engineer’s cabin with twin beds, a wardrobe and a bathroom, and 10 crew cabins each with two bunk beds, a wardrobe and a bathroom. The under lower deck houses the laundry and numerous storage rooms.